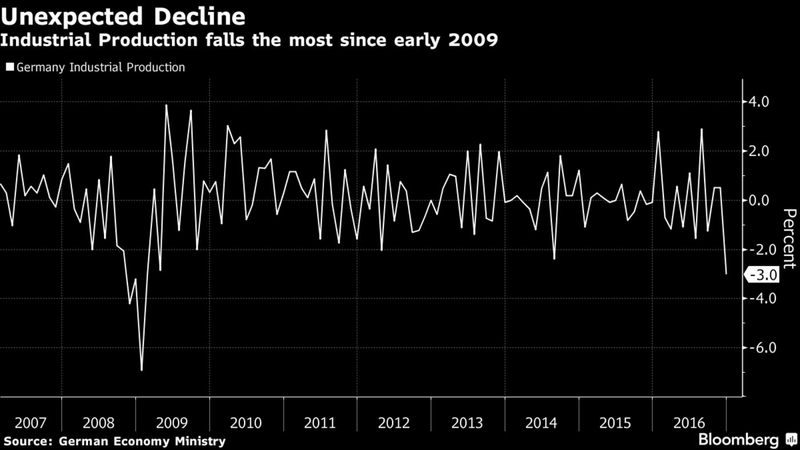 German industrial production unexpectedly fell in December as the timing of Christmas holidays damped manufacturing and construction. Output, adjusted for seasonal swings and inflation, dropped 3 percent from November, when it advanced a revised 0.5 percent, the Economy Ministry in Berlin said on Tuesday. The volatile indicator’s worst reading since early 2009 compares with a median estimate for a 0.3 percent increase in a Bloomberg survey. Production was down 0.7 percent from a year earlier. The ministry confirmed economists’ assumptions that the decline was largely due to reduced workdays during the holiday season and said the data don’t alter the government’s positive economic outlook. While business confidence slipped in January, unemployment dropped to a record low and a gauge of factory activity rose to a three-year high. But even Europe’s largest economy, the region’s growth driver, faces a series of risks that may damp output in the coming months. Protectionist trade policies under the new U.S. administration and complicated negotiations about the U.K.’s post-Brexit relationship with the European Union threaten to weigh on sentiment, just as a national election in September pits Chancellor Angela Merkel’s ruling party against a strengthening populist movement. Output in December was damped by a 3.4 percent decline in manufacturing, the ministry said. Construction fell 1.7 percent, while energy production dropped 0.9 percent. “As early as January, production will probably come in noticeably higher again, as is also signaled by available auto-production data,” said Ralph Solveen, an economist at Commerzbank AG in Frankfurt. Car output surged 11 percent in January from a year earlier, according to the German Automobile Industry Association. Today’s data come on the back of a Monday report showing factory orders bounced the most since 2014 in December. The surge was driven by demand for investment goods and saw both domestic and export orders rising. That increase in orders and sentiment indicators “signal a revival of production growth in coming months,” the Economy Ministry said.